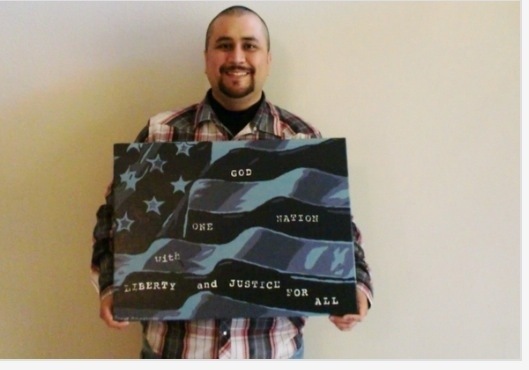 An original oil painting by George Zimmerman, the neighbourhood watch volunteer who shot Florida kid Trayvon Martin, has fetched more than $100,000 on eBay. The signed 18-inch-by-24-inch artwork depicts part of a blue American flag and includes the words “God,” “one nation,” and “with liberty and justice for all” printed in the stripes. That’s good for him. hopefully he can stay out of trouble and do good. It’s messed up how many people hate this guy.